If you have high blood pressure, I hope you're doing something about it. High blood pressure is a silent disease. If not checked, you might not know until it's done considerable damage. Research shows that 73 million Americans have hypertension, and many don't even know it. And many who know they have it aren't doing anything to treat it. Or they're treating it the wrong way. Dr. Christopher Granger is a Duke University cardiologist. He and colleagues at nearly two dozen U.S. institutions set out to find out what happens to patients with severe hypertension when they come to an emergency room. By severe, their blood pressure had to be above 160/110. Dr. Granger's team found that 90% of these patients already had a diagnosis of hypertension. That means 10% of them didn't know they had high blood pressure. And of those 90% who did know, about 25% of them were not taking the drugs prescribed for their condition. 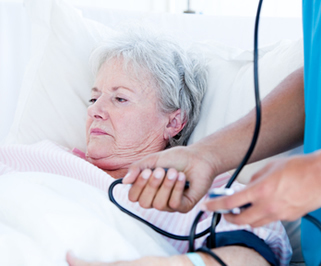 The researchers also found that extremely high blood pressure was related to high complication and death rates. Many of the patients already had major organ damage. Worse, over 6% of them died in the hospital. For those who survived, upon discharge, the doctors gave most of the patients prescriptions for at least two medicines. Even so, 41% had to be readmitted within three months. What may be most unsettling, however, is the fact that the investigators could not find any evidence in the discharge records of about 60% of the patients that there had been any attempt to schedule a follow-up appointment for them. Dr. Solomon Aronson is an anesthesiologist who also works at Duke. He sees danger in high blood pressure from another angle. He has spent years trying to discover the "sweet spot," or ideal range, of blood pressure during cardiac surgeries. Aronson led a team of investigators that analyzed over three million blood pressure readings in the records of 5,238 cardiac surgical patients at Duke over a nine-year period. They found that when the systolic blood pressure was below 95 or went higher than 135, the patients had a greater risk of death within the following month. The risk of death increased the higher and longer they deviated from that range. I'm a little tighter in guidelines. I've seen research that your risk of vascular disease goes up with systolic blood pressure over 120. That means that the long-held "normal" level of 120/80 is really the upper end of the safe zone. I believe normal blood pressure should be closer to 110/70. Mine ranges from 95-115/65-75. I'm refreshing your memory on hypertension because it affects one out of five of you statistically. You might not know that you have it. The causes are not a deficiency of drugs. They range from heavy metal poisoning to nutritional deficiencies, to sleep apnea, stress and poor lifestyle. Even a lack of sunlight and vitamin D can cause it! That said, I am not against the use of drugs to treat hypertension. If you have made good lifestyle changes and are otherwise dependent on third-party payment, they might be your only option. Third parties, like Medicare, are resistant to natural treatment, even if they are less costly than chemicals. I've covered many natural means to treat high blood pressure, which you can read about on my website. But today, let's look at the drug choices you have. If your blood pressure is greater than 160, the risks of the disease outweigh the risks of drug treatment. I do suggest rereading my past suggestions for no-drug management of your blood pressure. However, I would far rather you take a drug for hypertension than let it go untreated, especially for systolic pressure over 160. If you choose drugs, I suggest starting with a thiazide diuretic and supplement with potassium and magnesium as initial drug therapy. My next choice of drugs is of the ACE inhibitor class. The diuretics are the safest blood pressure drugs on the market, with ACE inhibitors a close second.